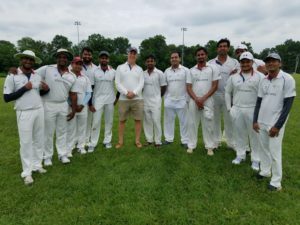 CC Pace recently partnered with The Stallions, a highly regarded team in the Washington Metro Cricket League (WMCL), as a corporate sponsor. Ashok Komaragiri, Lead Technology Consultant at CC Pace, is a member of the team and presented this opportunity to CC Pace. We sat down and had a conversation with Srinivas Mallapuram, captain and co-founder of The Stallions Cricket Team, to learn more about cricket and what this partnership means for both The Stallions and CC Pace. Can you explain the basics of Cricket to us? Cricket traces its origins to the late 16th century in England; it is now played in more than 125 countries. In terms of popularity, it is second only to soccer. A Cricket match is played between two teams of 11 players on a cricket field. Both teams take turns ‘batting’ and ‘bowling’. The objective of the batting team is to score as many runs as possible during their turn, while the bowling team tries to limit the number of runs scored by the batting team. In the second part of the game, the two teams switch roles and the team that formerly batted must ensure their opponents do not score as many or more runs as they did. Now, I don’t want to go too deep in explaining the rules of cricket here—there’s always Google for that, right? Tell us about cricket in the DMV area. Cricket has become a very popular sport in the DC Metro area, as evidenced by the number of different leagues in this area. Cricket is typically played with a leather ball at the professional level, but most leagues in the DMV area substitute the leather ball with a hard-tennis ball (looks like a regular tennis ball but is heavier). There are many different cricket leagues in this area; WMCL is one of the most prominent leagues. The Stallions are in the WMCL – can you tell us more about that league? The WMCL was formed in 2009. As of this year, there are 34 teams across two divisions (16 in Div1 and 18 in Div2). This league enjoys more popularity and participation as compared to other hard-tennis ball leagues, having close to 1,000 active players. The league has three cricket fields: one in Herndon, Centreville, and Reston. The games are played using the T20 format and are played over the weekend. I am proud to say that our team, The Stallions, are always considered one of the top contenders for the upper division title. How did the Stallions team get started? Our team was formed in 2010 by myself and a few other cricket enthusiasts. We now participate in 3 different hard-tennis ball leagues in the DMV area. We have a common pool of players, who play in these 3 different leagues, however some players only play in one of the 3 leagues. Our combined pool is comprised of 75 players. We are a highly successful team, and are generally considered one of the top teams in all 3 leagues. We were the runners-up in the 2017 Spring Season championship. How’s this WMCL 2018 Spring season been so far for Stallions? Of the 4 matches we have played so far this season, we won two. The two matches we lost were closely contested games right up to the very end. Overall, I am happy with the team’s performance, we would have liked more wins under our belt considering we have some tough games coming up. We are focused on winning our upcoming matches to secure a place in the playoffs. How do the Stallions feel about their partnership with CC Pace? Over the past several years, the different counties in the DMV area have tremendously encouraged and promoted Cricket in every way they can. Recently, some corporate companies have also extended their support by either sponsoring the leagues themselves, or individual teams. We are fortunate and thrilled that CC Pace has decided to sponsor our team in the WMCL for this year. At the risk of sounding clichéd, I think, fundamentally, our team’s principles align with those of CC Pace, in that we both strive for excellence, and I believe that makes a sound foundation for a good partnership. CC Pace, along with offering technology and business consulting services, also participates in a variety of community outreach programs; in true partnership, The Stallions have already joined in and started to participate with the company in these community events. Interested in catching a match and cheering on the Stallions?